Driving drunk is not only dangerous, it's expensive. Many people are turning to their smartphones to tell them if they are too drunk to drive home. The real question is whether smartphones are smart enough to do the job of a breathalyzer test. Can a breathalyzer app really tell you whether you are too drunk to drive, and can it save you from being arrested and charged with a DUI? Can a breathalyzer app help you make a more informed decision and potentially save your own life and the lives of others on the road with you? For less than $50, you can download an app on your phone that tells you whether you are too drunk to drive. If it sounds too good to be true, it's probably because you haven't taken the time to properly research this product. Breathalyzer apps are not a new concept and the companies that make them state they are perfect for helping you do the right thing. The police are not as positive that these tests are as accurate as you might imagine. Law enforcement worries you might not make a wise decision based on the fact that your app tells you you're fine to drive. It's time to educate yourself on mobile breathalyzer devices and the accuracy of each one. How Does a Breathalyzer App Work? If a police officer suspects you are drunk while driving, they have the legal right to ask you to submit to a breathalyzer test. This is a test that's administered by using a small handheld machine in one hand while you breathe into it. The machine reads your blood alcohol content (BAC) and tells the officer whether you are drunk. The legal limit in every state is .08 percent, though there are situations and some states in which this is only a standard. For example, if you are younger than 21, the legal limit might be 0 in some states or less than .08 percent in others. If you carry a commercial driver license (CDL), the legal limit in many states is .04 percent. If you were previously arrested and charged with a DUI, you are strictly forbidden from operating a vehicle with any alcohol in your blood at all. There are various factors that play into what is legal and what is not based on specifics. There is no easy way to predict what it will take to get you drunk, and your own personal feelings on the situation are highly inaccurate. Some people absorb and process alcohol faster than others. Generally, someone who weighs more and stands taller can drink more than someone who is smaller and not show as much alcohol in their system, but it's not always the case. Your age, your size, your weight, what you are drinking, and even what you consumed in terms of solid food that day all play a role in your BAC. To be sure, though, you might use a breathalyzer app, but how do they work? These apps work a little differently than handhelds. These apps do not require you breathe into anything, but they do measure your eye movement as well as the information you provide. Your eye movement is calculated using your phone's camera, or you are able to manually enter everything you had to drink that day or night into your phone to get a complicated algorithm to tell you if you're too drunk to drive. It's based on your honesty and your ability to accurately remember all you had to drink and what's in each beverage. It's easy to see this particular type of test might not be as accurate as others. The market is saturated with breathalyzer apps and other features that claim they can predict how drunk you are accurately enough to help you determine whether you should drive home or find a ride. Each one works differently, and each one has a different result. These breathalyzers were each used on the same person at the same time after one beer, and each one shows dramatically different results. The person testing each app then drank another four beers over the course of four more hours. This app allows you to plug a mobile device into your phone. You breathe into it, and the results appear in its corresponding app. This test showed the drinker had a BAC of .019 percent. After finishing five beers in as many hours, the test showed results of .082 percent. When the same person used this test seconds after using the first test, it showed results of .017 percent. After finishing four more beers, the results were .114 percent. When the drinker of one beer used this app, it showed results of .012 percent. Four beers later and the results were .091 percent. This app showed the person who had one beer had BAC of .031 percent. After four more beers, the results read .117 percent. As you can see based on the results of the person who personally tested each of these apps, the results are not conclusive or even similar to one another. However, you can see that each one did provide the accurate result that the tester was legally drunk and should not operate a motor vehicle. 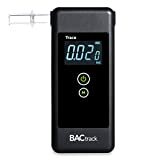 The tester notes that the BACtrack Vio always had the highest results and the BACtrack Mobile and Alcohoot consistently displayed very similar results as one another. However, the results are not guaranteed as entirely accurate. You can see you are drunk while using them, but you shouldn't rely on an app like this to tell you whether you are too drunk to drive if you are close to the legal limit. While you can use an app like this to see what your BAC is, do not place your future on the information provided by an app on your smartphone. It's not worth spending time in jail, paying thousands of dollars in fines, or losing your license. Your insurance rates go up, you face court fines and costs, and you might even face jail time if you are charged and convicted of a DUI. You risk putting your own life and the lives of everyone else on the road in danger if you rely on an app rather than your common sense. If you've been drinking all day, if you've had more than one drink, or you are worried at all that you might be drunk, play it safe. Law enforcement officials recommend staying out of the driver's seat if you've consumed any alcohol, and they do not recommend you rely on an app to make this decision for you. These apps provide you with a general estimate of your BAC, but they are not always accurate. If the app is not working correctly, if your handheld device malfunctions or you don't use it correctly, you could end up with misleading results that lead you to make a poor decision. Your life, your future, and the lives of others are too important for you to rely on an app to give you permission to drive. 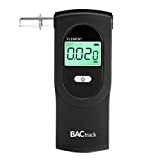 If you find yourself when you are even considering a breathalyzer app to tell you whether you should get behind the wheel of your car, it's probably a sign you've had too much to drink. When in doubt, always play it safe and call a designated ride home. A cab, a rideshare alternative, or even staying where you are for the night are all safer options than finding out for certain if your app is accurate. You don't want the police to be the ones to tell you your app is not as accurate as the manufacturer claims it is. Common sense is the best way to tell whether you are too intoxicated to drive. While it's true alcohol alters your senses and gives you false confidence in your decisions, it's safest to always designate a driver or find another way home after you've consumed any alcohol. Even if you are sure your one beer wasn't enough to make you drunk, you might not consider how little you've eaten all day or any new medications you are taking and how those factors affect your sobriety. Play it safe because no life is worth risking getting home after you've been drinking. 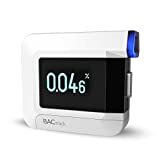 Hey Buddy!, I found this information for you: "Breathalyzer Apps: How Does It Work And Are They Accurate?". Here is the website link: https://www.duiauthority.com/breathalyzer-apps/. Thank you.